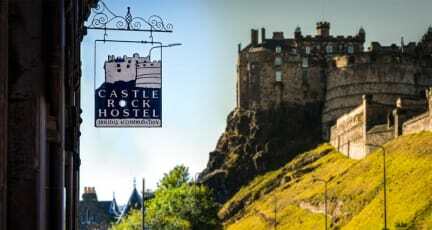 Castle Rock Hostel is in an ideal location just beside Edinburgh Castle, up the hill from Grassmarket. This carefully-decorated hostel has clean, spacious, themed rooms that our guests have described as 'lovely and warm', as well as a large kitchen and multiple lounges, so there's plenty of space to meet others or find a quiet corner. Hostelworld travellers have said 'the staff are wonderful and great at answering questions and giving advice about what to see and do (and not) in the city'. We like their popular, highly praised walking tours and pub crawls. They don't accept guests under 18. Enjoy being in Edinburgh's best location & being at the very heart of the city. We are just a stroll from the bus, train and the airport bus and a 1 minute walk from Edinburgh Castle, 1 minute from the Royal Mile & 1 minute from the Grassmarket. We are in a relatively quiet street but the city's wonderful, late night-life is also just around the corner – ideal! Built in 1846 and turned into a backpackers hostel in 1997, we have packed this grand old building full of art, character and antiquity. Some people say it is more an art gallery or museum than a hostel. We think you will love it with our bright, sunny and spacious rooms and great facilities like FREE Wi-Fi, a movie room, a delightful patio and a fire place for those cold winter nights as well as plenty of room to kick back and relax or join in the fun with other travelers. 24 hour Safe for total security. We also have two other hostels in the Old Town of Edinburgh; the small & vibrant Royal Mile Backpackers and the historic High Street Hostel, Edinburgh’s original independent hostel! Be aware that if you book for a group your reservation will be cancelled and you will lose the 13% deposit. We are an 18+ hostel. We have a 7 night maximum stay- this includes making consecutive separate reservations. We do not have a lift as we are in a heritage building and all our rooms are either up or downstairs! You will need to walk uphill to get here so be warned your legs will feel the burn but it's oh so worth it! If you do not show up on the arrival date of your booking you will be charged the first night and the rest of your booking will be cancelled. SPECIAL CANCELLATION POLICY FOR AUGUST/NEW YEARS / HOGMANAY: All New Years / Hogmanay reservations between the 29th of December and the 1st of January must be cancelled 7 days in advance prior to 2pm on the arrival date. If it is less than 7 days in advance, YOU WILL BE CHARGED FOR THE FIRST NIGHT. FAILURE TO SHOW WILL RESULT IN THE FIRST NIGHT BEING CHARGED AND THE RESERVATION WILL BE CANCELLED. The best hostel I've ever been! Lovely staffs and awesome atmosphere! There are always some activity to make you know more people. Unfortunately, I couldn't join them but for sure it is a perfect place to stay in Edimburgh. Amazing hostel! Staff were friendly and helpful, great facilities, amazing vibe and fun events each night for travellers. Would definitely recommend to anyone. Best hostel I’ve ever stayed in! Super cute and clean with a castle theme throughout (and each room has a different theme too!). By far the best value I’ve ever had staying in hostels! Had such a great time! Truly. The location of your building and the overall aesthetic are so unique and awesome. I never fill out review but I had to say how great my stay was. This is an amazing hostel! Right in the heart of the old city next to the castle and a 2 min walk to the royal mile. Beds were comfy, lockers in room, great common areas and vibes to meet other people. The pub crawl was really fun. Cons: musty smell/really warm in the room, no bed shelf, walls were thin and the door squeaked every time someone came in/out. Bathrooms could use an update. Breakfast very basic considering it wasn’t free. Overall really great place to stay and 100% would return! Very strategic location! Excellent cleanliness at all places in the hostel Very spacious rooms, common rooms and kitchen. Design is simple and neat. Mixture of classic and modern furniture. All staff are friendly and helpful. Possible to install bigger lockers/shelves in room (maybe near the door) to fully utilize the room's area? Money for value breakfast indeed. Would recommend to have ham/eggs in breakfast as well, to balance a bit. Highly recommended hostel. For what I paid I was really happy. The staff were relaxed and nice to talk to. I would happily return, great location! Castle Rock Hostel is in an ideal location just beside Edinburgh Castle, up the hill from Grassmarket. This carefully-decorated hostel has clean, spacious, themed rooms that our guests have described as 'lovely and warm', as well as a large kitchen and multiple lounges, so there's plenty of space to meet others or find a quiet corner. Hostelworld travellers have said 'the staff are wonderful and great at answering questions and giving advice about what to see and do (and not) in the city'. We like their popular, highly praised walking tours and pub crawls. They don\'t accept guests under 18.